Our Wire-rope Electric Crane hoist is a kind of light-small lifting equipment which is Score No.1 for continuous 30 years and sold well both domestic and abroad. Motor: Electric Crane Hoist Motors are equipped which has safety limiter in both up and down directions. And the motor is Conic rotor brake motor, in order to adapt to the frequent direct start in the intermittent work. 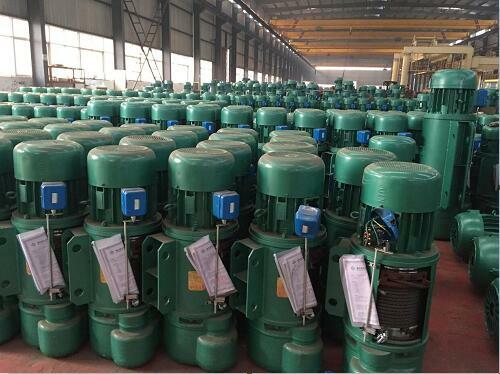 Gear Box: Electric Crane Hoist Gear Box has specially treated gears for high wear resistance. Each Geared Shaft assembly is supported on ball or roller bearings, to ensure smooth, low-friction operation. Rope Guide: Rope Guide is in two halves, ensuring easy accessibility. It encircles the Drum completely so that the rope may not uncoil even when the Hoist is in unloaded condition. The rope guides of our company is thickened and dilated, so that it is not easy to be damaged. Hook: The Electric Crane Hoist hook is closed type with high safety; it wrought with special high quality steel.